Left photo: Original winery building was constructed in 1902. Photo from early 1960’s. Right photo: Winery building after restoration in 2012. Whispering Bluffs Winery opened the doors for business on May 26, 2012. Located in Potosi, Wisconsin and nestled along the scenic Mississippi River, Whispering Bluffs Winery is directly across the street from the Potosi Brewery and National Brewery Museum. Whispering Bluffs Winery is a purveyor of an assortment of fine wines. Our wines feature local varietals such as Maréchal Foch, Marquette, Noiret, LaCrosse, Brianna, and Edelweiss. Many of our grapes are grown in the Whispering Bluffs Vineyard located in nearby Cassville. In addition, many wine enthusiasts are fond of our specialty fruit wines and seasonal wines. Tastings are offered daily for $8.00. Tasting visitors select five fine wines and receive a Whispering Bluffs wine goblet with their tasting. 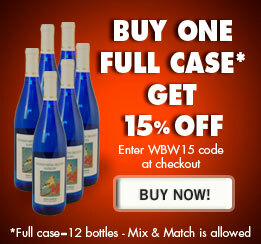 Customers wishing to purchase a case of wine will receive a 15% discount off the case price. All of our wine bottles are collector’s items. The labels are beautiful reproductions of original artwork depicting the birds of the Upper Mississippi Valley painted by Wes Helmick, a local artist who also is our winemaker. His original acrylics of birds and the landscapes of the Upper Mississippi Valley hang throughout the Winery. The Whispering Bluffs Winery is proud to offer a large and unique selection of quality items to complement your wine selection. We have exquisite handmade chocolates sold individually or in gift boxes. Or, choose from our Wisconsin cheeses as well as a large selection of teas and coffees– espressos and lattes too. Gift items abound including gourmet food items, fun wine gifts, hard-to-find housewares items, specialty apparel, and accoutrements for the wine connoisseur. Whispering Bluffs Winery is located directly across the street from the historic Potosi Brewery and National Brewery Museum, just a short distance from Pine Point Cabins and Grant River Recreation Area. The Winery is located in the beautifully renovated Potosi Bottling Plant building. Comfortable seating, including a “living room” within the winery, encourages guests to sit and enjoy their wine or coffee while utilizing the free Wi-Fi. Soaring ceilings, exposed brickwork, hand-milled wood walls and ceilings all create an environment that serves as a beautiful backdrop and perfect venue for celebrations and special events such as birthdays, anniversaries, corporate parties, engagement events, bachelorette parties, and baby showers. 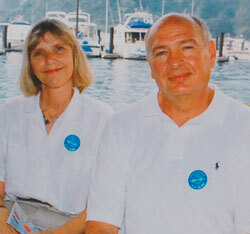 Wes and Janet Helmick retired in 2006 from Ginkgo Intl. Ltd, the company they founded in 1977. While with Ginkgo they traveled in the USA, Europe and Southeast Asia. They also supplied many customers through their San Francisco office and warehouse. Travel gave them the opportunity to enjoy the vineyards and wineries in northern California as well as the wine regions of France. The ambience and lifestyle of the French countryside inspired their vision for a vineyard and winery in southwest Wisconsin. In 1997 they purchased land on the bluffs overlooking the Mississippi River. The higher altitude exposed the vines to the sun as well as the warming influence of the Mississippi River. The geographical formation of the bluffs forced the cold air out of the vineyard. This was a perfect vineyard setting. Whispering Bluffs Vineyard has over 1100 grape vines including the red varieties of Marachel Foch, Marquette, Noiret, Frontenac, Petite Pearl, Concord and the white grape varieties which include Brianna, St. Pepin and Lacrosse. In 2012 Whispering Bluffs Winery was opened in downtown Potosi. We now offer several varieties of wine, including wine from apples grown in Gays Mills, WI and cranberry wine from cranberries grown in Wisconsin. Whispering Bluffs Winery is located in scenic southwest Wisconsin on the Great River Road. Potosi is a destination for birders, outdoorsmen, bikers, hikers and those who enjoy fine wine. Come visit the winery and enjoy the many attractions offered in the area including the National American Breweriana Association museum located in the Potosi Brewery and several dining options. Beautiful log cabin accomodations are available just down the street from the winery at Pine Point Lodge. Enjoy our many wines from the distinct terroir of southwest Wisconsin.